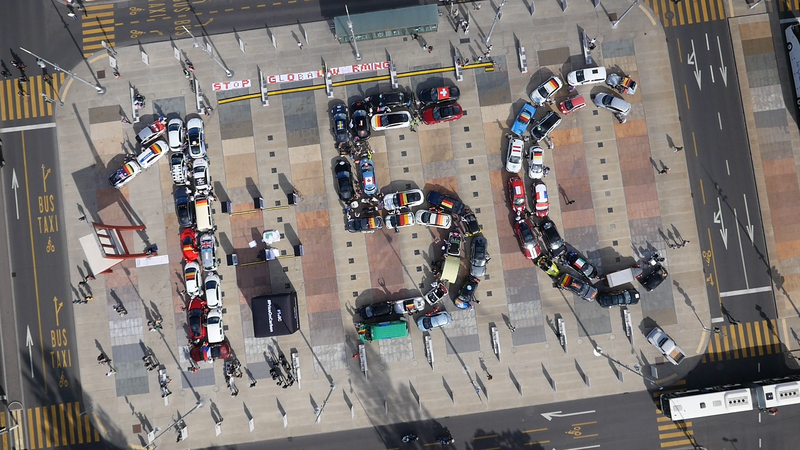 Geneva – 17 June, 2016: Europe’s largest electric vehicle rally, bringing 75 teams from 13 nations, entered its finishing phase at Geneva today on the Place des Nations, part of a 1,300km traverse from Bremerhaven, Germany with a simple objective: zero emissions for 1.5 degrees. Wolfgang Jamann, Secretary-General and CEO of CARE International, a partner of the #1o5C campaign, highlighted its work with the poorest and most vulnerable communities that are also the hardest hit by climate change impacts. “The 1.5 degrees limit is a Paris Agreement message of hope, and we call on governments to urgently translate that hope into action for a future free of poverty and harmful greenhouse gas emissions,” he said. Amid the electric cars, a black cube represented the carbon emissions that would have entered the atmosphere from each car during the two days of the rally had the vehicles not been electric. Several organizations partnered to organize the public campaign: The World Advanced Vehicle Expedition (WAVE), both the UN Environment and Development Programmes (UNEP and UNDP), the Climate Vulnerable Forum (CVF), the UN Office for South-South Cooperation (UNOSSC), the World Alliance of Cities Against Poverty (WACAP) CARE International, the Climate Action Network (CAN), and the Cleantech21 Foundation.